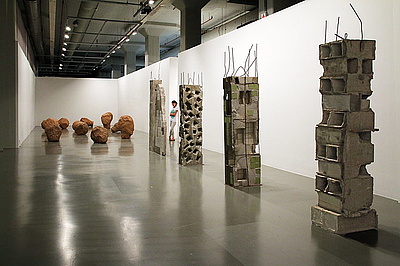 The 14th Istanbul Biennial takes at least three days to visit fully. 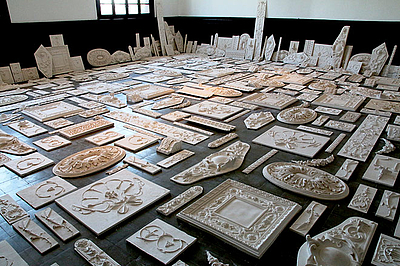 Artworks, objects and performances by more than 100 participants are presented in 36 venues, mainly in the district of Beyoğlu and on the island of Büyükada (Princes’ Islands), but also at Sivriada island (1), in Kadiköy (1), the Old City (1), Şişli (2), at the Northern end of the Bosphorus (2), and a fishing boat on the Bosphorus itself. SALTWATER takes place in museums as well as temporary spaces of habitation on land and on sea such as boats, hotels, former banks, garages, gardens, schools, shops and private homes. "Salt water is one of the most ubiquitous materials in the world. Sodium in our bodies makes our neurological system, and thus our vital systems, work; it literally keeps us alive. At the same time, salt water is the most corrosive material threat to the digital age: if you drop your smart phone in fresh water, you can dry it and it will probably work again. If it falls into salt water, chemical molecular changes in the materials of your phone will break it. 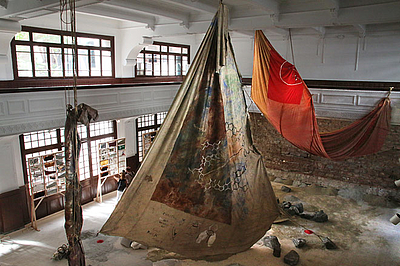 When you visit the 14th Istanbul Biennial, you will spend quite a bit of time on salt water. There is a slowing down of the experience of art due to the travel between venues, especially on ferries. That is very healthy: salt water helps to heal respiration problems and many other illnesses, as well as calming the nerves. This sprawling exhibition spans from Rumelifeneri on the Black Sea, where Jason and the Argonauts passed searching for the Golden Fleece, through the winding and narrow Bosphorus, a seismic fault line which opened as a water channel some 8500 years ago, and down to the Princes’ Islands in the Sea of Marmara towards the Mediterranean, where ancient Byzantine emperors exiled their enemies and where Leon Trotsky lived for four years from 1929 to 1933. 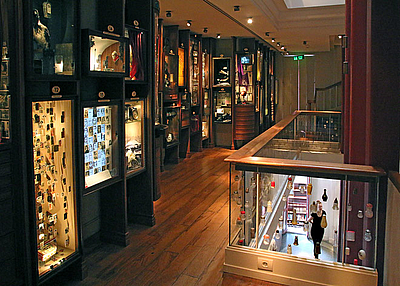 It presents over 1500 artworks, some very tiny, including over fifty commissions by artists as well as other visible and invisible manifestations such as materials from the history of oceanography, environmental studies, marine archaeology, Art Nouveau, neuroscience, physics, mathematics and theosophy. Works range historically from an 1870 painting of waves by Santiago Ramón y Cajal, who received a Nobel prize in 1906 for discovering the neuron, to the ground-breaking abstract Thought Forms of Annie Besant and Charles Leadbeater (1901-1905), up to a new installation by Aslı Çavuşoğlu which reflects on an ancient and lost Armenian technique for extracting red dye from an insect, and a new multichannel installation by William Kentridge inspired by Trostky’s passage through Turkey." Interlocutors and alliances of Carolyn Christov-Bakargiev for the 14th Istanbul Biennial include Anna Boghiguian, Aslı Çavuşoğlu, Cevdet Erek, Pierre Huyghe, Emre Hüner, William Kentridge, Marcos Lutyens, Chus Martínez, Füsun Onur, Emin Özsoy, Griselda Pollock, Michael Rakowitz, Vilayanur S. Ramachandran, Arlette Quynh-Anh Tran, and Elvan Zabunyan. The 14th Istanbul Biennial is organised by the Istanbul Foundation for Culture and Arts (İKSV) and made possible thanks to the sponsorship of Koç Holding. İKSV is a non-profit cultural institution founded in 1973. 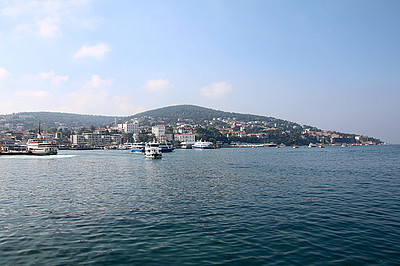 The general objectives of the Foundation are to celebrate Istanbul as one of the world's capitals of culture and the arts, to connect and share past and present knowledges and values from around the world via culture and the arts, and to contribute actively to the development of cultural policies in Turkey. With these objectives, İKSV organises the Istanbul Festivals of Music, Film, Theatre and Jazz, as well as the Istanbul Biennial, the Istanbul Design Biennial, autumn film week Filmekimi and other special events. Since 2010, İKSV has been operating in Nejat Eczacıbaşı Building, designed in an Art Nouveau style at the beginning of the 20th century by architect Georges Coulouthros, and located in Galata neighbourhood, between Tarlabaşı and Şişhane. During the three-year restoration process that began in September 2006, the building’s original characteristics were preserved and elements that had disappeared over the years were returned to their original state.